There's nothing quite like a freshly baked loaf of bread: Crispy on the outside, warm and fluffy on the inside and emitting yummy aromas throughout your home. Bread requires precise measurements and exact ingredients to make sure the rise, texture and taste of the bread is perfect. Flour is perhaps the most important component, but many people with food allergies or cooks looking to experiment utilize alternative flours that create loaves just as delicious as those made with traditional bread flour. Bread flour is made from hard spring wheat, which contains more protein than all-purpose flour. This helps gluten develop during the bread-making process helps breads develop structure and texture. It contains between 14 to 16 percent gluten, while all-purpose flour has only 10 to 12 percent. The exact gluten content will change depending on the brand and the country you are in. The high-protein content of bread flour helps breads develop stronger structure, giving it a pleasing chew, and helps yeast breads rise faster and higher. The more protein -- and thus more gluten -- there is in the flour, the denser and chewier the final product. Bread flour, like all-purpose flour, can be bleached or unbleached, and is used only for breads, such as pizza crusts and bagels. Breads made with all-purpose flour may be crumbly and less elastic than those made with bread flour. There are many flours on the market these days that can be used to substitute all-purpose or bread flour. While there are a lot of choices, some flours are better fit for bread-making than others. All-Purpose Flour. This pantry staple is frequently called for in bread recipes and is a great replacement for bread flour. 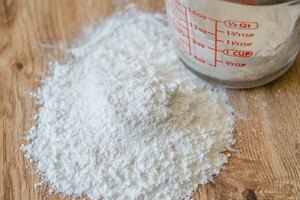 All-purpose flour has 12 percent gluten, which is usually enough to bind bread ingredients well and all-purpose flour can be substituted using a 1:1 ratio with bread flour. Chickpea Flour. Chickpea flour is made from garbanzo beans, is gluten-free and gives structure to baked goods on account of its high protein levels. 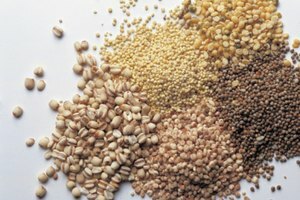 The flour is dense and has a slight bean-like flavor, so cooks should consider adding more sugar or alternative flavor additives to mask the taste. Almond Flour. Made from ground, blanched almonds, almond flour is gluten-free and a great substitute for all-purpose and bread flour. High in protein almond flour gives baked goods shape and the natural oil found in almonds keeps bread moist. Cooks should be aware that almond flour does have a sweet, nutty taste and that may need to be tempered with other ingredients. Sorghum Flour. This gluten-free flour is made from ground whole grain kernels of the sorghum plant. Sorghum can substitute all-purpose flour in a 1:1 ratio and has a mild, sweet flavor. It's high in fibre, protein and iron.